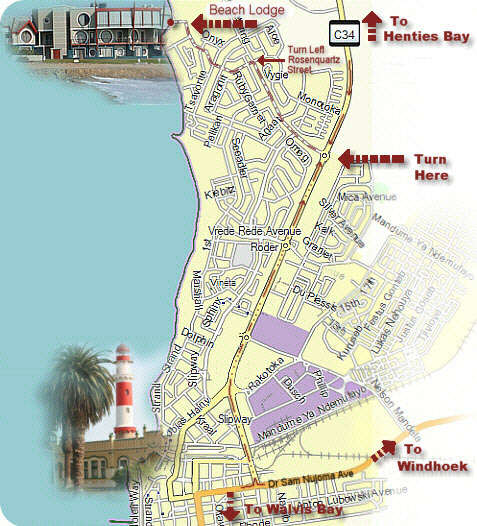 At the first traffic circle you should turn right into Dr Schwietering Street (Ocean View Shell Service Station on your right), continue for approximately 0.5 km (past Welwitschia and Fischreiher turn-offs) and turn left into Rosenquartz Street (Beach Lodge/The Wreck Restaurant Light Box) and continue for approximately 1 Km (past Tsavorite and Emerald turn-offs) into Plover street (past Shearwater turn-off) and turn left into Stint Street, a dead end. We are situated at the end of the street just before you hit the ocean. Take the C34 to Henties Bay, drive through the first 2 traffic circles, then turn left at the third traffic circle into Dr. Schwietering Street (Ocean view Shell Service Station on your right), continue for approximately 0.5 km (past Welwitschia and Fischreiher turn-offs) and turn left into Rosenquartz Street (Beach Lodge/The Wreck Restaurant Light Box) and continue for approximately 1 Km (past Tsavorite and Emerald turn-offs) into Plover street (past Shearwater turn-off) and turn left into Stint Street, a dead end. We are situated at the end of the street just before you hit the ocean. Take Strand Street which runs parallel to the beach and continue in a northerly direction until you reach Flamingo Street (Beach Lodge/The Wreck light box). Turn left into Flamingo Street and continue until you reach the intersection with Tsavorite Street. Turn right into Tsavorite Street and continue until you reach the intersection with Rosenquartz Street. Turn left into Rosenquartz street (past Emerald and Shearwater turn-offs) and turn left into Stint Street, a dead end. We are situated at the end of the street just before you hit the ocean. Or find us with Google Maps . . .